We love this cucumber yogurt sauce on everything from sandwiches, to salads, to snack plates! It makes a great sauce for grilled meat and a fantastic dip for veggies an pita bread. For best results, make in advance and allow dip to chill before serving. You can do this 2-3 hours in advance or make it the day before! Place a box grater on a cutting board and grate half an English cucumber into little shreds. If using a conventional cucumber, peel before grating. Chop into small pieces with a chefs knife and sprinkle with sea salt to draw out the water from the cucumber. While cucumber sits, combine yogurt with lemon juice, minced garlic, salt, parsley, mint (optional but tasty!) and season with garlic powder and dried dill. Now that the cucumbers have had a few minutes to sit, Wring out the liquid by placing your cucumber in the center of a small stack of 3 paper towels, Squeeze/twist to get the water our over your sink and then add the cucumber to your dip. Stir and season with any additional salt and pepper you desire. Feel free to season with any extra dill or garlic powder as well - let your taste buds be your guide! Serve with all your favorite dippers, sandwiches, or proteins. 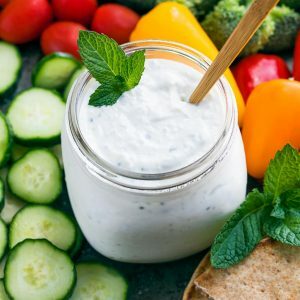 This fresh tzatziki sauce is great on everything! Feel free to mix and match the herbs based on what you have handy. I grow mint and parsley outside so I usually have an ample supply of both! Just make sure you're using some sort of herbs for the dip to flavor it, otherwise you're going to want to bring flavor in some other way like by adding more garlic, lemon zest, or additional dried spices. This sauce tastes great fresh and flavors are even more amplified the following day. Garnish however you'd like! Some choose to add some fresh mint or parsley on top, or top with a drizzle of olive oil and a sprinkle of paprika. Enjoy! Dip nutrition facts below are an estimate provided by an online nutrition calculator.